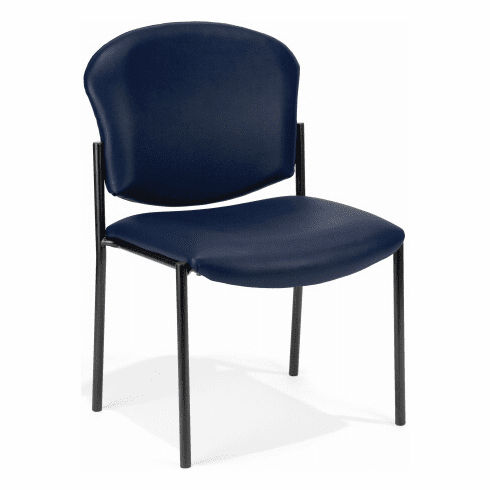 This armless stacking chair from OFM features your choice of easy to clean, low maintenance vinyl upholstery or stain resistant, commercial grade fabric upholstery. Both the vinyl and fabric chairs are available in your choice of (5) different colors. Other features include thickly padded seat and back rest cushions, waterfall seat edge, round steel frame with four post legs for stability and easily stacked for easy, space saving storage. Optional dual wheel casters available for a minimal charge. Dimensions: Seat Size: 19"W x 20"D. Back Size: 20"W x 16"H. Seat Height: 18"H. Overall: 33"H x 23.6"W x 23.5"D. Limited lifetime warranty from OFM. This chair normally ships within 1-2 business days.